"I still hate the darkness. All it does is bring back the most horrible memories." Things just keep getting worse for Tokyo-3 in the penultimate volume of Neon Genesis Evangelion on DVD. The series has really hit its stride in these later episodes, and I consider the final two discs to be the best in the series, at least dramatically. While there is still a bit of action to be had, fans who enjoyed most of the series' earlier episodes, with their emphasis on robots and explosions, will find less to like as the show concludes. Gradually, there has been a shift from the action to the characters. Really, the whole plot�SELEE, NERV, the Angels, and the Evas�is all just a window to the fragile, often shattered psyches of the characters. Giant mechas are just a ploy, a gimmick, a decoy—the real stories lie in the complexities of human nature and relationships. Pretty heady stuff for a cartoon (or TV in general for that matter); but then, as we've seen, this is no ordinary series. Collection 0:7 contains episodes 21-23 of this 26 episode series. Up to this point, the most mysterious character in the labyrinthine plot has been Ghendo Ikari, Shinji's father. There are many mysteries: his relationship with Shinji, his doting on Rei, the death of his wife, and the level of his involvement with, and commitment to, SELEE and NERV. When the SELEE Committee interrogates Ikari's second-in-command, some of his past is revealed. The Eva project and its goals are still maddeningly complex and vague, but bits and pieces begin to fall into place here. While the focus is on Ikari, there are also other intriguing (and perhaps shocking) glimpses into the past lives of Ritsuko, Misato, and Kaji. The themes and orchestration of this episode closely mirror those in episode 20, except this time, it is Asuka that is forced to relive her traumatic past. When the 15th Angel attacks, Asuka sorties in Unit 02, but the invader penetrates her Eva's defenses and makes contact with Asuka physically and mentally. It peels away the layers of her mind, apparently, "attempting first contact with a human". Asuka is a frustratingly distant character, and in this episode, we are drawn closer to her than we'd like. Again, there's a bit of action, and more intrigue concerning SELEE and the mythic Human Instrumentality Project, but this is mostly just another example of the unconventional goals of the series. How often do you truly delve into the mind of a cartoon? And a deeply troubled, insecure cartoon at that? This one is a biggie, topped only by episode 24, and these two represent the final, traditional, chronological episodes of the series, so everything pretty much turns to chaos. Asuka is recovering, badly shaken after her encounter, deeply troubled by her failure. Conveniently, the 16th Angel chooses this moment to attack. 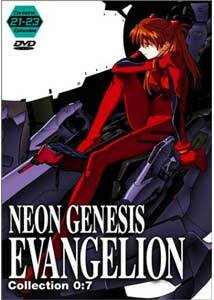 With Shinji still grounded after his Eva went berserk, Rei must face this, the most powerful intruder yet, all by herself, and a terrible sacrifice is the price for victory. Startling revelations about Rei and Ghendo Ikari abound, and the ending is note perfect, the best moment in the series thus far. With just one more volume to go, Neon Genesis Evangelion is reaching the breaking point. While not everyone will be fascinated by the story's psychological overtones, those who stick with it will find the final episodes extremely rewarding. I can't help but be drawn into this series every time I watch it, and with the end so near, the wait for Volume Eight may be the toughest yet. Image Transfer Review: Another fine entry, image-wise. The colors are saturated and clean, with just a hint of digital compression in several scenes. The problem with the black level that plagued the previous volume is gone, and once again, blacks are accurately represented. The image is very clean, with good fine detail, and the source materials seem to have been in fine condition. Audio Transfer Review: ADV always provides a wealth of audio choices on the Eva discs, but I prefer the original Japanese. That being said, all of the tracks are of similar quality, so language selection is up to personal preference (I have always had a soft spot for the mostly good English dub, as it served as my introduction to the series). Once again, this volume features a front-heavy mix, with a fairly narrow front soundstage. The score and sound effects are spread out to the mains, with support for directional effects in the actions scenes. Some of the "inside the mind" scenes also feature some nice directional and surround effects, so I'm grading this mix a bit higher than the last. Extras Review: The same set of extras as the previous volumes: spoiler-ish character bios and an ADV trailer gallery, accessible above. Once again, extra points for the multiple language support. Series' creator Hideaki Anno has said the Evangelion series was part art, and part therapy. He worked through the pain in his life through his characters. With much damage already done, Collection 0:7 only plunges the characters deeper into despair, but their plight is relevant to many of the issues at the core of human nature. Yes, I know I sound like I am reading too much into it, but watch it first, and then decide.